For some reason this past month I seem to have finished a lot of products! 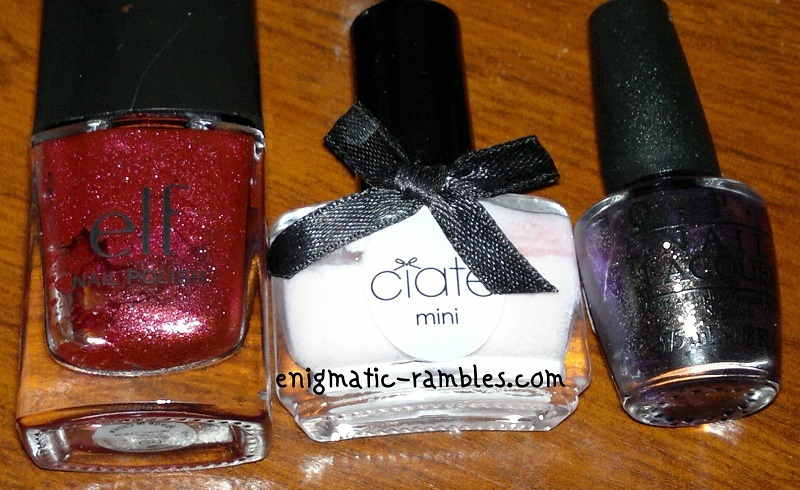 ELF - Cranberry - Not a bad nail polish, shimmer isn't a favourite finish of mine so I won't be repurchasing [swatch]. Ciate - Cutie Pie - This one went all bitty and strange, I'm not keen on semi opaque pinks so again won't be repurchasing [swatch]. OPI - First Class Desires - I liked this polish but it is very similar to Stargazer 161 so I won't repurchase this one either. Leighton Denny - Remove and Go Pot - This did the job well, I have a couple of these so don't need to repurchase any at the moment [review]. Leighton Denny - Crystal Finish - Quite a good relatively fast drying top coat, it does smudge nail art though. Technic - Purple and Grey Stripe Pens - I had half used these about five years ago and not touched them since so time for the bin. 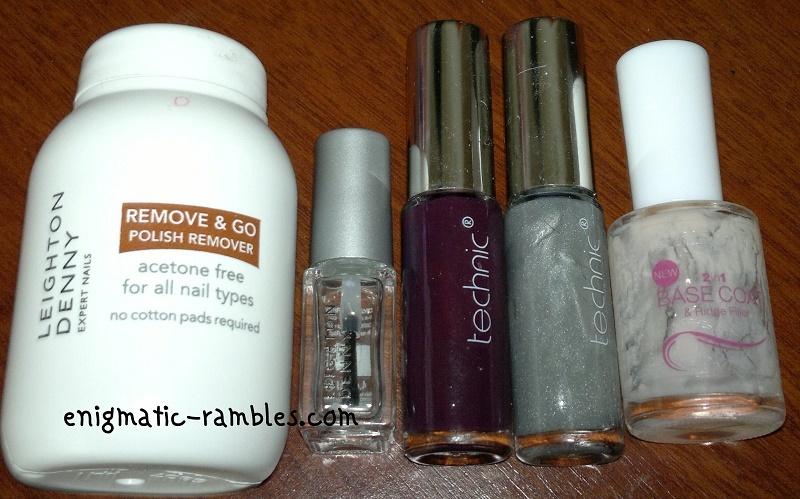 Collection 2 in 1 Base Coat - I like this base coat and I am sure I will repurchase it at some point. 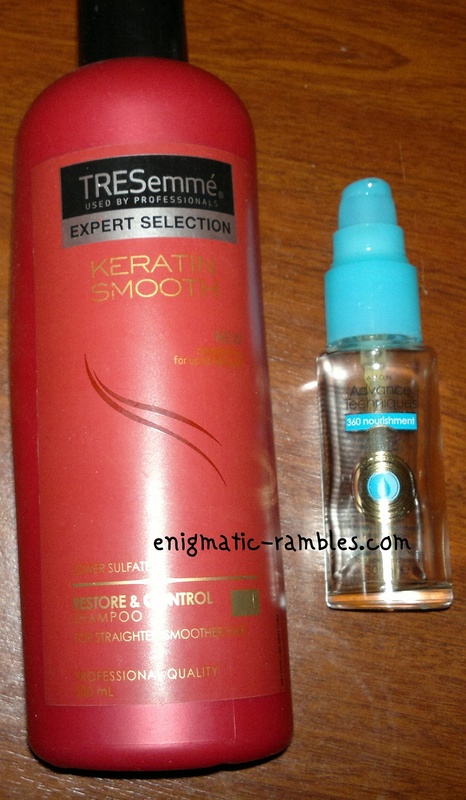 TRESemmé - Keratin Smooth Shampoo - I never really have any opinion on shampoo, it either cleans your hair or it doesn't. This one though is actually one I liked a lot, it does clean your hair, but it also helped to reduce frizz and means I can avoid using heat to straighten my hair. Left my hair smoother and easier to manage. I haven't had any keratin treatment done to my hair, but used this anyway. Avon - Morrocan Argan Oil - This hair oil is good for the price, although don't go thinking it is actually argan oil as the amount in this is minimal. That said I still liked this, full review coming soon. Revlon Colorstay - Buff - Used this up, Buff is my shade and I like how it is long lasting and medium / full coverage. Applied with fingers or a make up sponge it can be a medium more natural coverage foundation, applied with a brush though and you can really work it up to a full coverage. 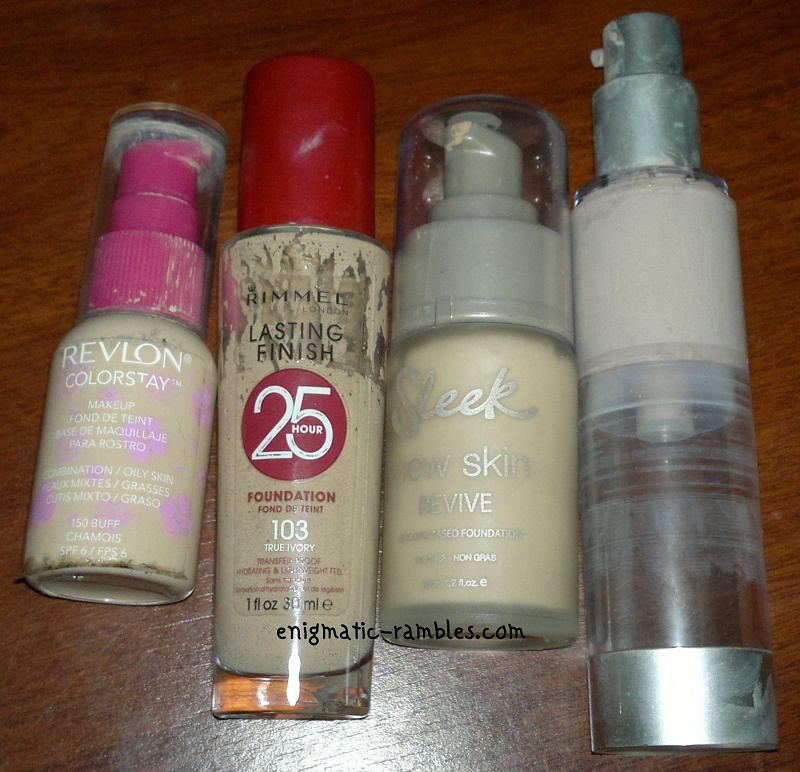 When I wear this foundation I don't need a concealer. I need to get a new one ASAP! A good, reliable foundation [review]. Rimmel Lasting Finish - True Ivory 103 - This is slightly too dark for me, that said I still used it up. This wears well and has good coverage, this is a close second favourite foundation to the colorstay. True Ivory 103 is lighter than Ivory in my opinion, however since I last purchased this it now comes in even lighter shades which is something I would like to try out [review]. Sleek - New Skin Revive - I didn't use this up, it went out of date. it just didn't sit well on my skin, the bottle was quite chunky too. Skin 79 - Super BB Cream - This went out of date. It also seemed to make me look grey in tone which isn't something you want. It made me look ill [review]. 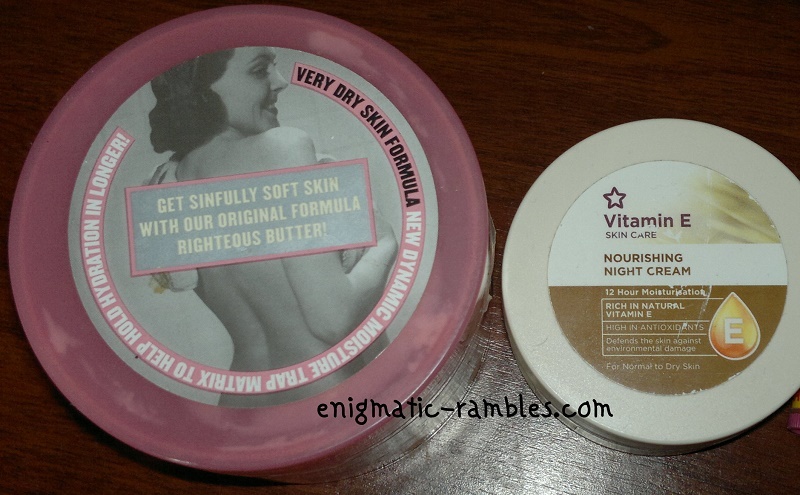 Soap and Glory - The Righteous Butter - I put off using this for so long, I don't like the sticky feeling on your skin you can get from using some body butters. First time I did use this I regretted not using it sooner, it isn't sticky at all, and it is a great all over body moisturiser. It is quite expensive but you do get quite a lot and the jar does last a good while. The scent is traditionally Soap and Glory and it does linger on the skin for around 12 hours. I have another jar of this to go through then I will consider a repurchase. Superdrug Vitamin E - Night Cream - Really like this and will keep repurchasing it for now but I don't know for how much longer as I am getting older and may need something more age appropriate soon [review]. 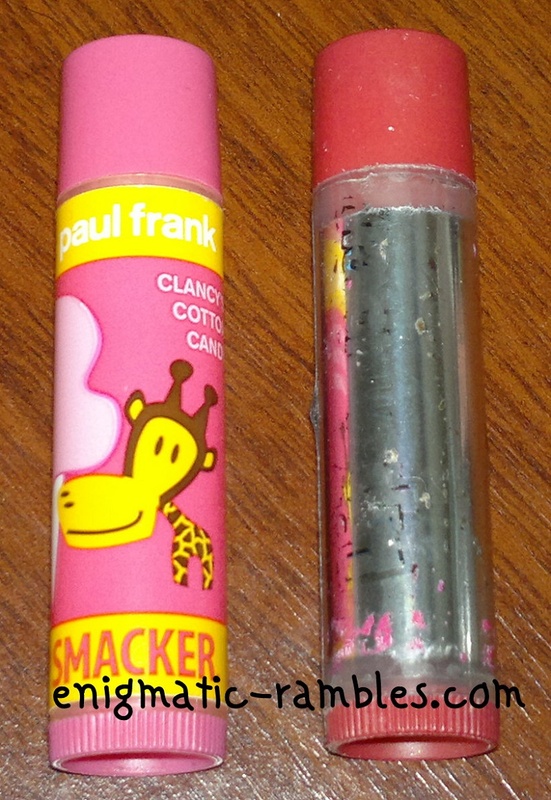 Paul Frank - Cotton Candy Lip Balm - This was okay, it didn't leave any colour on the lips and was slightly plastic-y in scent.